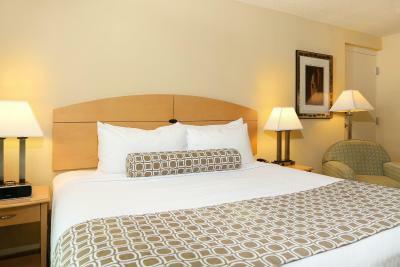 Lock in a great price for Crowne Plaza Hotel Orlando-Universal – rated 8 by recent guests! My kids really enjoyed the views of roller coasters at Universal from our room. Location wasn’t too far from Universal Parks. However, due to all the construction, it is not walkable. The bed was soft but not too much for me, my partner felt it was too soft. Staff was helpful and concierge fairly knowledgeable about parks. I liked that the pool area and fitness room was very spacious. The workout room and pool area were great. Beds were updated and comfortable. Hotel was very clean and quiet. Beds were super comfy! We had a great time. It was the perfect weekend getaway. Nothing it’s not deserved to be a 4 stars hotel. Over rated hotel o don’t recommend it at all. Dinner was mediocre. 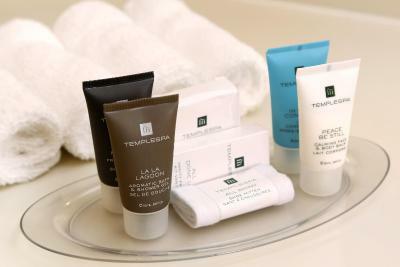 beds are very comfortable, Lavazzo coffee machine in the room was a pleasant surprise. Decent gym. 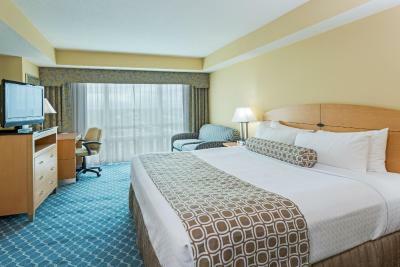 Crowne Plaza Hotel Orlando-Universal This rating is a reflection of how the property compares to the industry standard when it comes to price, facilities and services available. It's based on a self-evaluation by the property. Use this rating to help choose your stay! 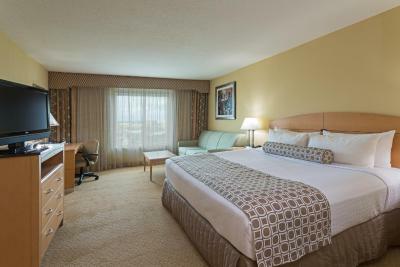 One of our top picks in Orlando.This Orlando hotel is less than 5 minutes' drive from the Universal Orlando Resort. Free local area transfer service is provided to the Universal Orlando Resort, SeaWorld, and the Walt Disney World Resort. An outdoor pool with a hot tub, poolside tiki bar, and deck are open to all guests. Complimentary WiFi is provided for all guests. 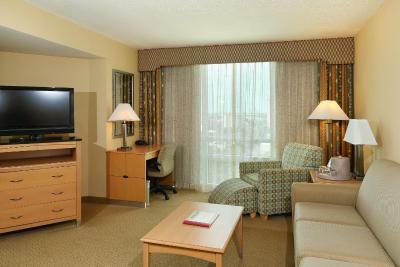 Large windows and a flat-screen TV are provided in each room of the Crowne Plaza Hotel Orlando-Universal. Tea and coffee-making facilities and a work desk are also included. A fitness center, games room, and tour desk are also available. Elements at the Crowne Plaza Orlando serves breakfast, lunch and dinner daily. Elements Bar and Grille, located in the lobby, serves a full menu for lunch and dinner. The Disney World Resort is less than 8 mi from the Orlando Crowne Plaza Hotel. I-Drive 360, Home of the Orlando Eye, is less than 1.2 mi away. The Orange County Convention Center is a 10 minutes' drive away. 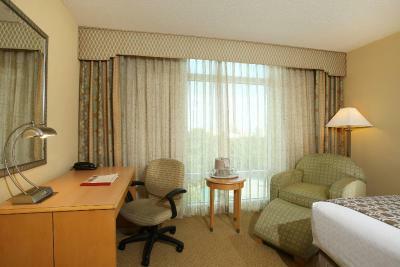 When would you like to stay at Crowne Plaza Hotel Orlando-Universal? This studio features a wet bar, a refrigerator, and a sofa bed. Additional seating space is provided as well. 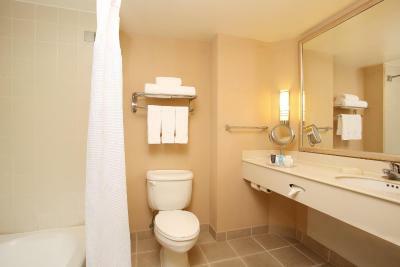 This room features a flat-screen cable TV, small refrigerator, and microwave. 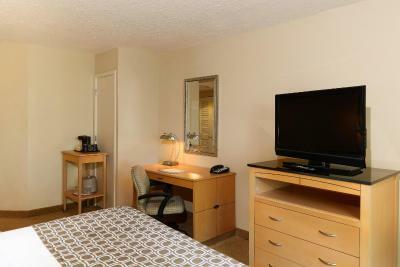 This room features a flat-screen cable TV, CD player, and safe. 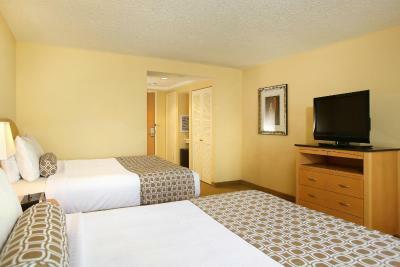 This room features a flat-screen TV with cable channels. 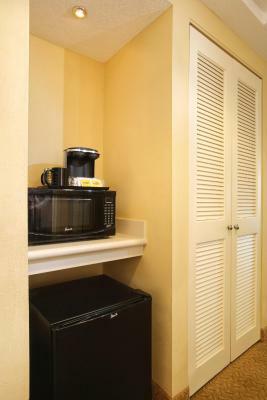 A refrigerator, coffee maker, and microwave are provided as well. 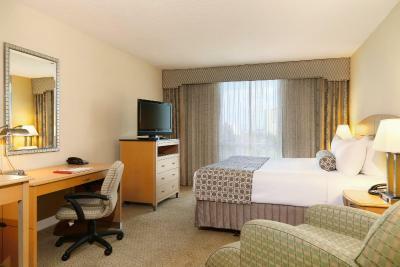 This room features a flat-screen cable TV, sofa bed, floor-to-ceiling windows with a city view. 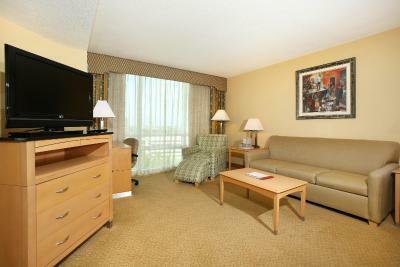 This room features a flat-screen TV with cable channels. A coffee maker is provided as well. 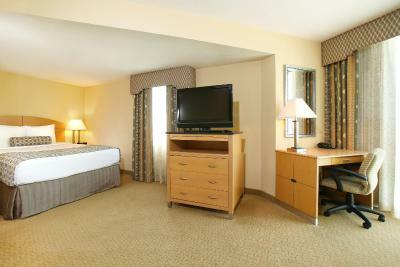 Featuring a sofa bed, this deluxe room includes a flat-screen TV, safety deposit box, and a work desk. This twin room has air conditioning and iPod dock. 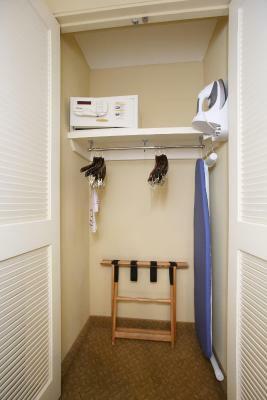 A disability accessible bathroom is provided. The outdoor courtyard is a great space to relax in after a long day of meetings. Relax at the Tiki Bar, open year-round (weather-permitting) or curl up on the comfy couches near the fire pit. 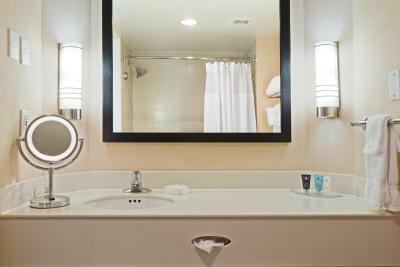 House Rules Crowne Plaza Hotel Orlando-Universal takes special requests – add in the next step! Crowne Plaza Hotel Orlando-Universal accepts these cards and reserves the right to temporarily hold an amount prior to arrival. A credit or debit card is required to check in to the hotel. Please note the local area transfer service has limited hours of operation. Seats are given based on availability. Contact hotel for details. Please note that additional fees are subject to tax. Cash payment is only accepted upon checking out. Well maintained with excellent location and great staff. Breakfast very good and nice pool area. Would stay again. bathroom was ild with partially clogged bathtub and the blanket on bed was stiff and thin. The carpet feels dirty. Parking fee charged and 50 dollar deposit charged. Free breakfast would be nice! I did not find the beds very comfortable but maybe just a personal preference. stayed there almost two weeks then had to leave because it was full, thought they should have squeezed us in because we are here for two more weeks and are now at Marriot. Rooms very dated, and felt the carpets in rooms were not very clean. Poor air conditioning and very noisy. Location staff and pool area. After the first day, no one came to clean our room. We had to request clean towels and someone came to remove our trash. The next day our room was cleaned. Van to Disney was unpredictable. I ubered back and forth. Very close and worth the 8 bucks. Clean Quiet. Convenient to everything. The shuttle service was poor. Freq. late with decommissioned public buses, one of which had several cracked windows, loose seats, and couldn't take wheelchairs. Lights horror-house style flickered when turned on, and bathroom lights hummed like a bug zapper the entire time they were on. One outlet only half worked. I did not like that the hotel didnt offer more amentities and other things such as toothpaste, slippers, mouth wash like some other hotels near by.